The DAKA GF 10 2017 catalog is now available! 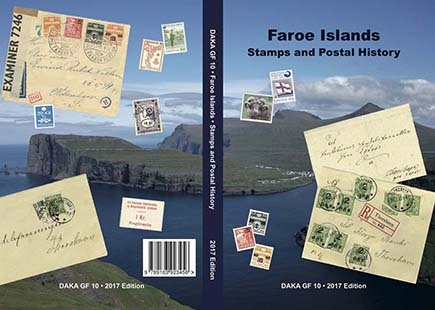 The primary reference for Faroe Islands collectors, the 2017 edition is the first update in seven years and contains substantial updates from the 2010 edition. New sections include Essays and WW I Postal History. The biggest improvement is an almost complete rewrite of the WWII Postal History chapter with much more in-depth information on routes and usages relative to past editions. I am proud to have served as the editor for this edition, working with Stefan Heijtz who was its publisher. Please visit the publisher's website for more information on the catalog. Looking ahead to future editions, I am maintaining a list of GF10 Catalog Updates, tracking additions and corrections to the 2017 edition. Copyright ©2003-2017 Geoffrey Noer. All rights reserved.